This is a free opportunity offered HEC(Higher Education Commision of Pakistan) in Pakistan for every student studying in any BS/MS programs from any university recognized by HEC. A new way of being unique from the crowd. It is a certification offered by Microsoft after successfully completing and passing exam of any Microsoft office product. Exam is conducted by certiport exam system on computer. How is it offered free by HEC? 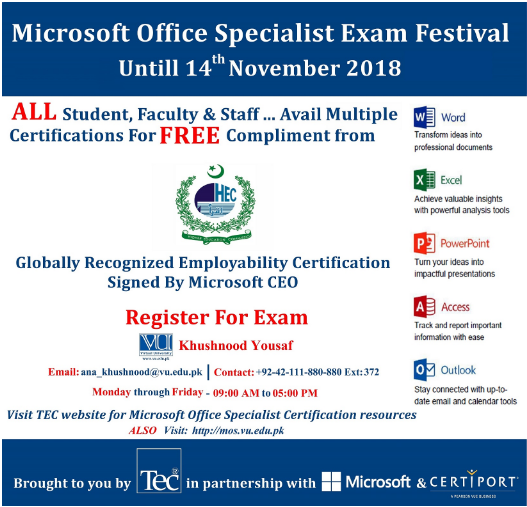 This is a free opportunity offered by HEC(Higher Education Commision of Pakistan) in Pakistan for every student studying in any BS/MS programs from any university recognized by HEC. A new way of being unique from the crowd. STEP I: Visit http://mos.vu.edu.pk and download MOS Registration Guide. STEP II (a): Download MOS Offline Contents (Learning Plan, Syllabus, Course Contents, Slides, Test Assessments, etc.) for self-study and practice. STEP II (b): Enroll as VU Student / VU Faculty / VU Staff at Microsoft Imagine Academy (MSIA) as per instruction given in the guide booklet for free online MOS Training. STEP III: Once a candidate gets trained as per the syllabus and practiced well for MOS Exam, he/she should register as a Test Candidate at Certiport as per guidelines of the guide booklet to appear in the said exam. 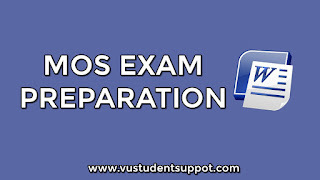 STEP IV: Email to the VU Campus which is most suitable to the candidate and request the administrator to schedule MOS exam in which he/she wants to appear like Word, Excel, etc. For MOS Excel Exam and MOS PowerPoint Exam preparation we give online classes with affordable fees for more details contact us.